Colourful flower shaped highlight marker. White centre with Pink, Orange, Yellow, Green and Blue chisel shaped fluorescent highlight colours with matching caps. 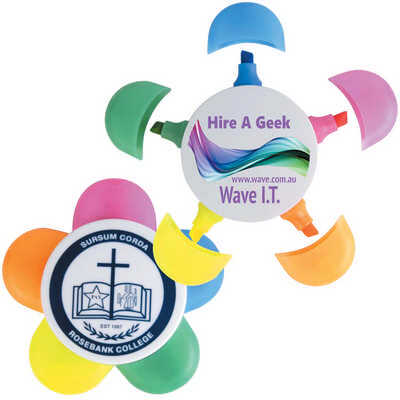 Colours - White Size - Centre 57mm Diameter; Full width 100mm Diameter Decoration Area(s) - Pad Print : Front/Back - Circle 50mm Diameter; 4CP Digital Direct Print : Front/Back - Circle 53mm Diameter.